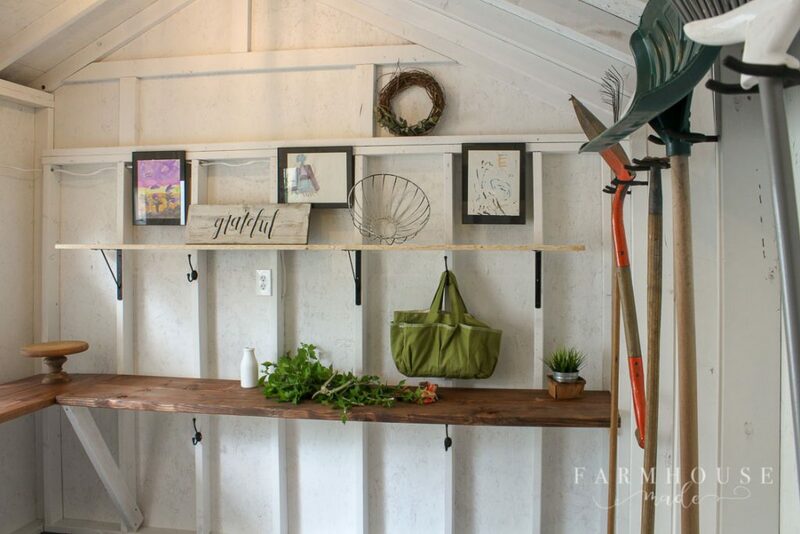 This shed has gone from cob-web central to a farmhouse style she shed perfection. 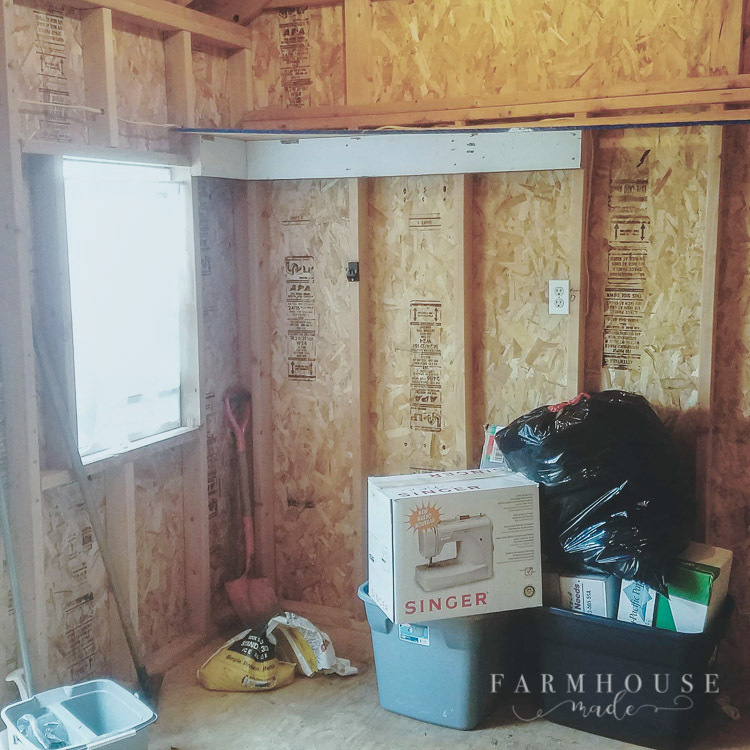 It’s got tons of storage and work space, and is now the perfect area to do all the relaxing, creating, gardening, and organizing! 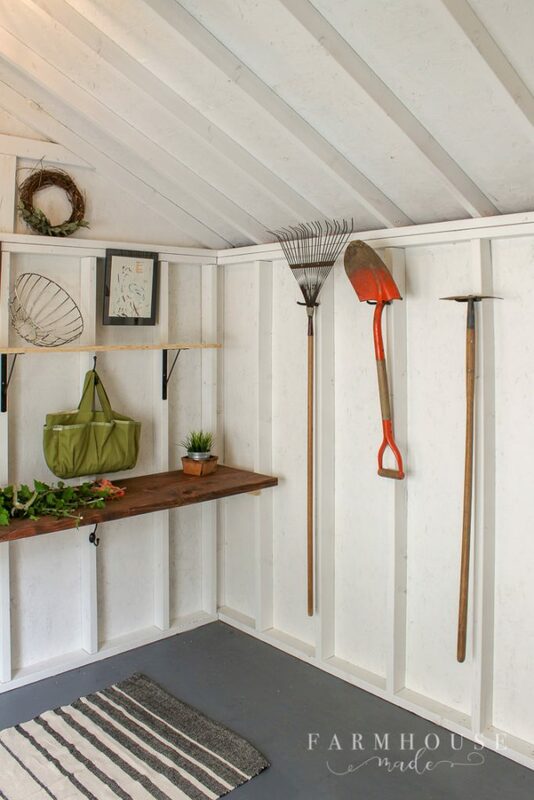 All you need is a little paint and some inspiration to get an amazing she shed! My mom has an adorable shed behind her house, and that poor little shed was basically empty, dark, a bit spidery, a little cobwebby, dusty. You know, like an empty storage shed you toss a lawn mower in with some utility buckets and random Christmas decor, and shut the doors. The house she moved from had a basement and 3rd bedroom, and this one has 2 bedrooms and no basement… so the spare bedroom has become a storage room, while there was a perfectly dusty shed going relatively empty… for 2 years now. She loves to garden and sew and craft, so we thought some stacked shelves for rubbermaid bins on one end, hooks for tools in the center, and a long workbench would be awesome for the kids to come over and create, or for her to plant flowers, clean pots, start seeds and such, would be awesome out in a little she shed. My lovely friends at HomeRight have sponsored this project & post, and thank heavens they did because there is no way on Earth I was going to roll on all the paint in here. Nay, friends. 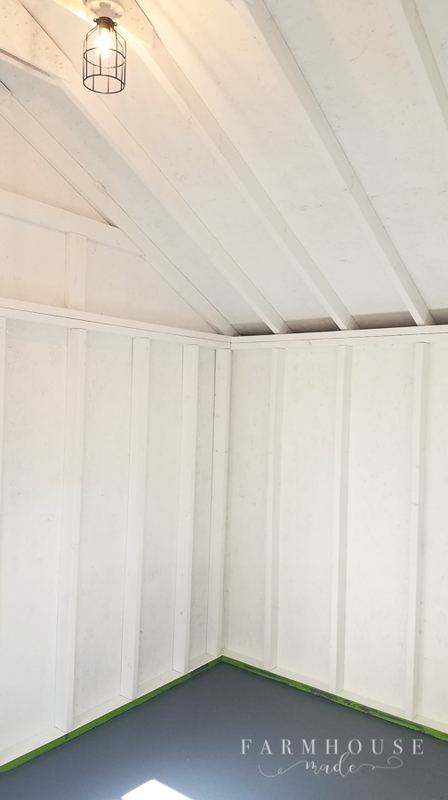 For this she shed makeover project, I whipped out my favorite sprayer – my Finish Max Extra, and grabbed the white paint, and got to work. You can get all the details about what comes with this glorious sprayer right here! 1. You don’t have to thin the paint before you spray it. 2. You can tip the sprayer without the seal leaking. Say what? We painted our kitchen cabinets last fall with this sprayer, and that was when we fell in love with it immediately for the non-thinning aspect, as well as being able to spray at an angle. Those two things alone make spraying ridiculously easy! Like any paint job, you will remove the electrical covers and such, add tape where you need it, and I covered the windows with this nifty stuff. Once I was prepped, I readied the sprayer. I filled my sprayer cup, adjusted the take-up tube to angle to the back of the cup (since I’d be pointing it up mostly), put the lid on, plugged it in, climbed the ladder, and started attacking the ceiling. My theory was to eat the frog (insanely hot in the peak, up and down on a ladder stinks), and work my way down the walls. I have a fun fact for you too, in this video, I tipped the sprayer past 45 degrees, don’t do that! You could get some paint in the motor if you go that far, so tip, but don’t tiiiiiiiip! You could totally prime first, but I got paint and primer in one, in high-hide white (un-tinted, right off the shelf) with an eggshell finish, and went for it, assuming from the get go I’d have to do 2 coats at least all over. I have this theory that I can paint any room with 1 gallon of paint. I also have a theory that I can paint all small things with a sample jar of paint. Stop laughing at me, right now! 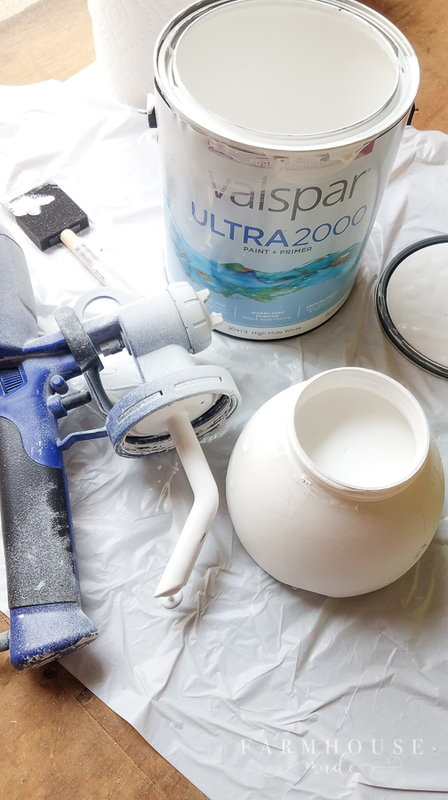 I know for a fact that not all rooms are 1 gallon rooms, and not all projects are sample jar projects, but I was really angry when I realized my initial 1 gallon purchase only got me 1 1/2 coats on the ceiling. This lofty goal is from the same part of my brain that sees the arrival time on a GPS as the time to beat. 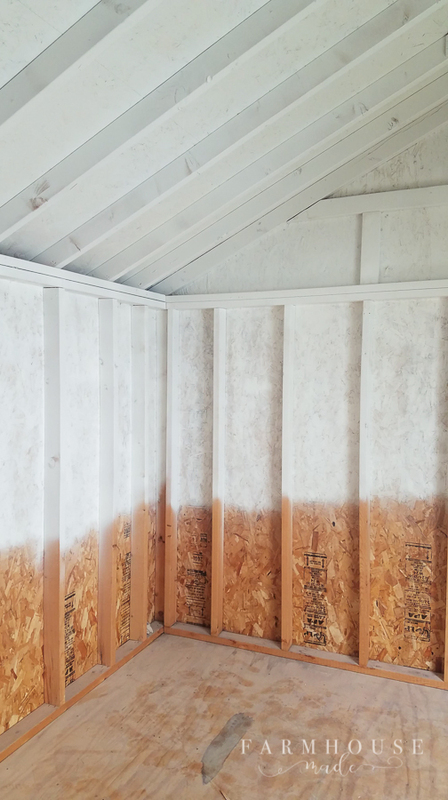 Don’t disillusion yourselves… this project is so not a 1 gallon room. More accurate is the 3 gallons I ended up grabbing, to use 2 1/2 of them. 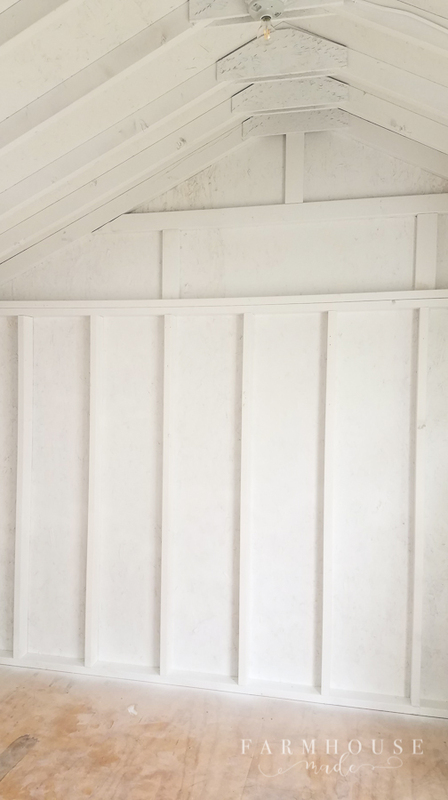 This shed was about 10′ x 20′-ish… but I didn’t measure (act surprised by this). 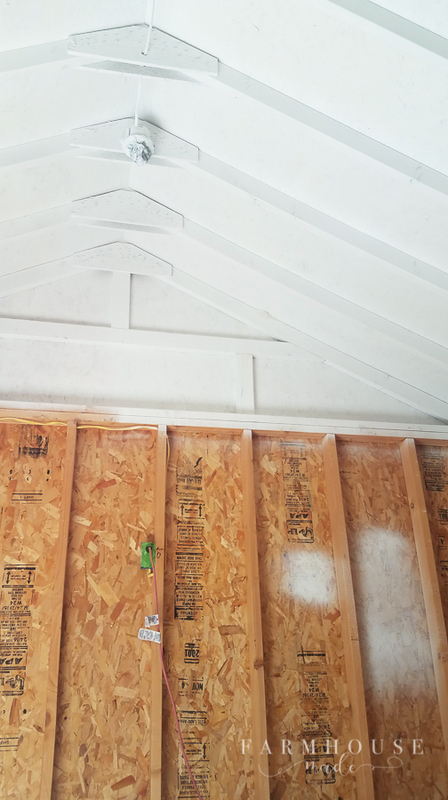 I absolutely loved how fast the sprayer was on both the ceiling and walls. If the sprayer wasn’t a major player in this, there’s no way I’d be able to tackle this project because I’d probably need have flooded the shed with tears of sadness and have to bail myself out with a roller. The walls were done super fast with 2 coats in 1 day, and were drying nice and evenly by the time I finished cleaning out the sprayer (literally only takes 10 minutes!). Once the walls were done and totally dry, I cleaned the floor and taped the bottom of the walls to prep for floor painting. You could absolutely spray the floors as well because the angle in the sprayer definitely allows for that. It’d be super simple to continue the white across the floors and just spray your way out (twice). 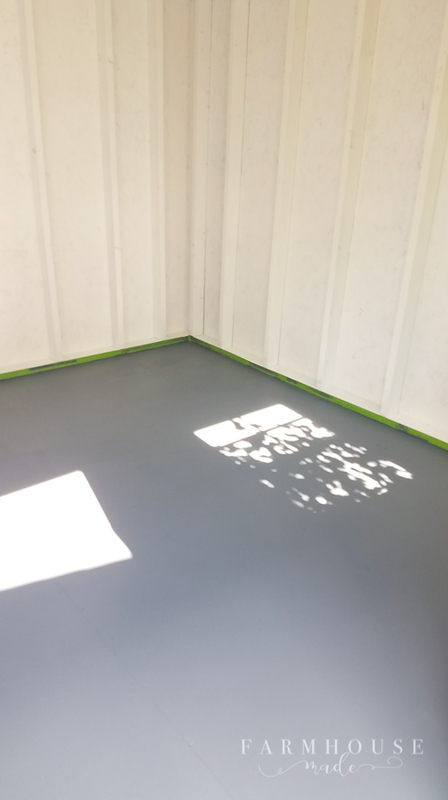 We opted for a dark grey porch and floor paint with a roller, however you could spray this also, we skipped that to avoid having to drape and tape for the overspray. I brought in reinforcements (the kids) to help with the clean-up and organizing, while I swapped out the electrical outlets, switches, and added adorable cages with pretty LED Edison-style bulbs (these are 60W, soft white bulbs), painted the grey floor paint on the floor, and left it to cure untouched for 3 or 4 days. If you’re staring at an empty space that’s dark and brown and cobwebby, it’s really hard to imagine what could be. It’s still a little bit hard when it’s all white and clean and walkable-in-bare-feet. 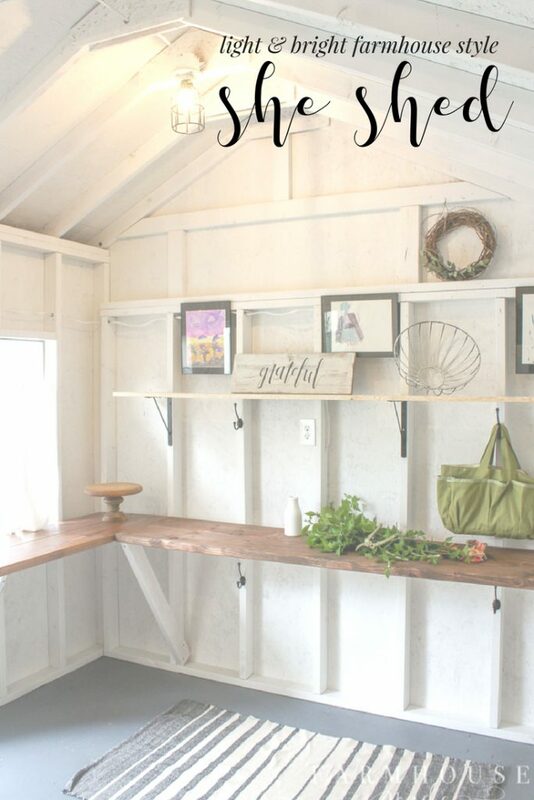 I had imagined space for storage bins, hooks for tools, hooks for garden bags and kids stuff, a cute rug, bright and airy, and a super long work table and shelf to store pots and things in this new light she shed. 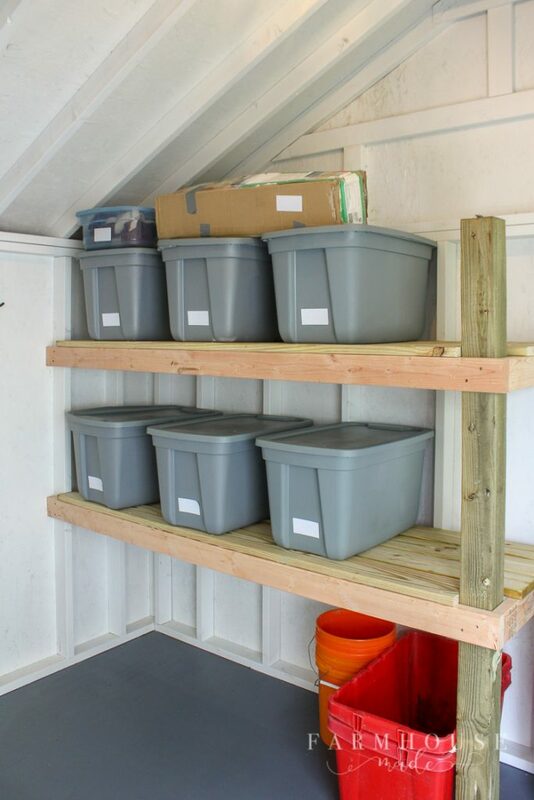 We built shelves like these in our basement and in the garage, and since my mom is on the shorter side, we made a slightly shorter and shallower version so she could reach everything and not need a step stool, and still have all the storage space she needs. We added these coated utility hooks all along the back wall for tools like shovels, rakes, brooms, mops, leaving room to grow. 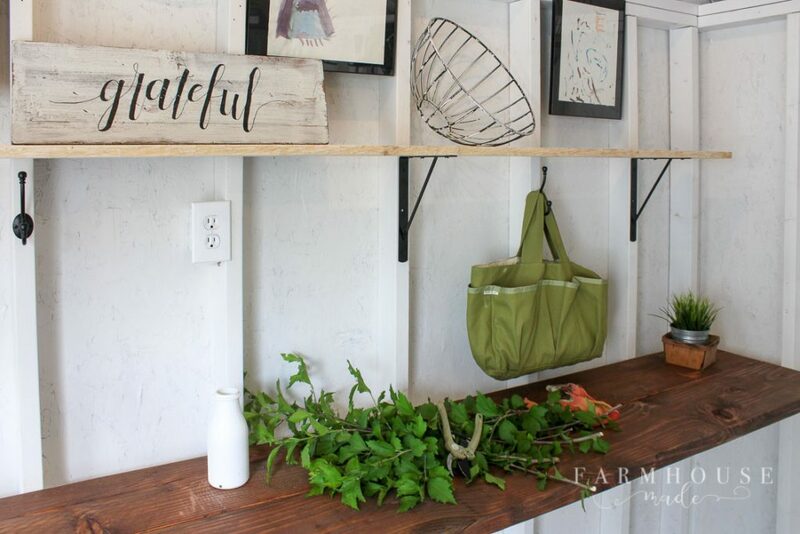 For the work space, we decided to make an L shaped table under the window and down the length of the wall, as a space for her to craft with the kids, cut flowers, or plant some veggies and flowers. I wanted to leave tons of storage room underneath for some rolling bins or baskets for all the heavy things no one wants to lug off shelves. Everything looks better with an adorable rug. Can you believe my mom got that rug at Five Below?! 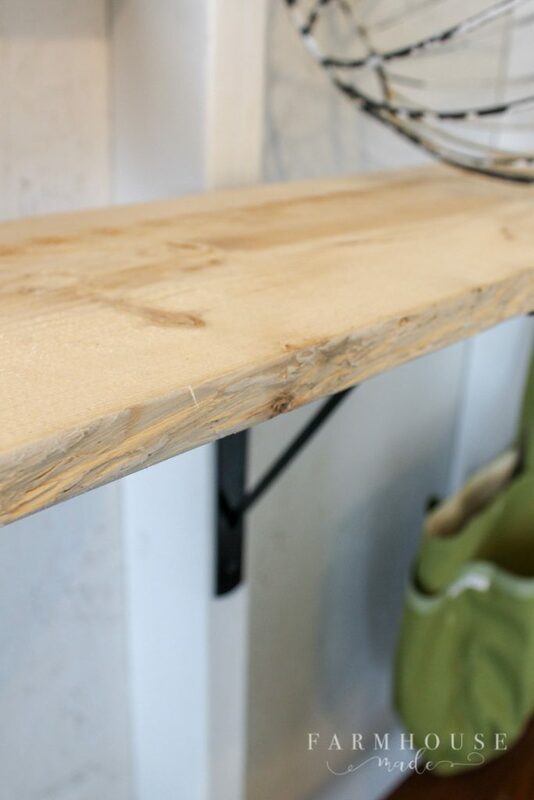 We added a reachable shelf with some black brackets and an 8′ piece of rough cut pine (just sanded down smooth) above the work table for storing some pots and supplies, showing off some of the kids’ artwork, and a few pretty coat hooks for garden supplies. There are a few other hooks around for keys, supplies, bags, whatever she needs, and a little spot for her trash can and recycling bins, and even the hose in winter. I cannot believe how huge this she shed looks now, and how clean and bright is it. 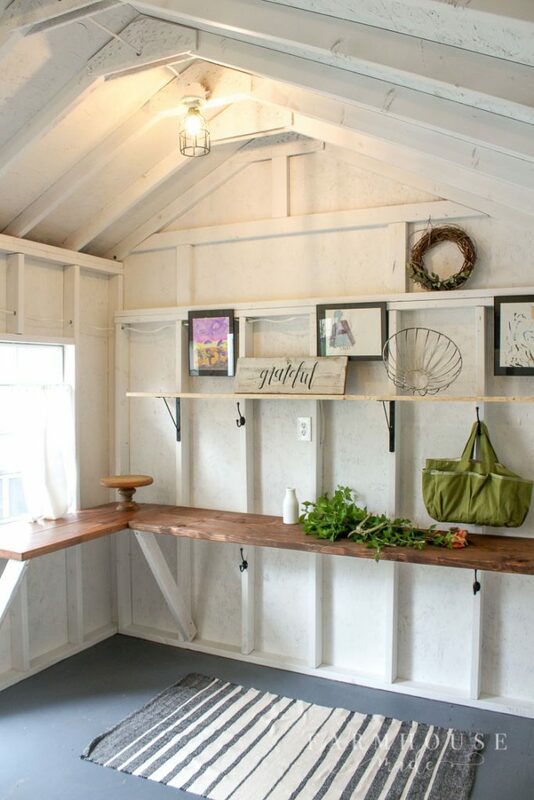 It makes me want to rope off part of the woodshop/garage to make a tiny adorable she-shed area for me and all my books and white furniture and white walls and hoarded furniture. I’m just kidding, I’d need the whole garage for all my hoarded furniture, and many more gallons of paint. This is so fantastic!!!!! I can’t believe how gorgeous everything looks. Kim this amazing! We have a shed that looks just like this one, I wonder if I can talk the hubby into turning it into a she shed? How lucky your mom is to have such a wonderful daughter to do this for her. Well done!! Oh my LANTA! No words! This space looks breathtaking! 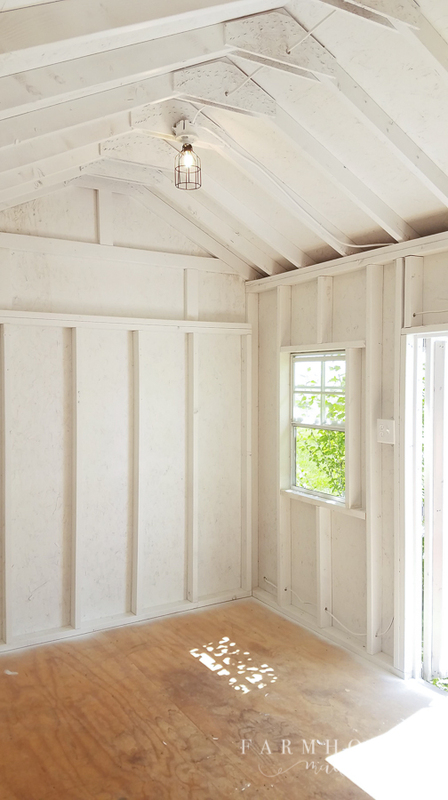 I’m trying to convince my husband to let me paint the inside of our shed white like this so I can use it as an office space. He keeps saying it’s going to be too much work with having to prep the inside before painting. I guess he’s taking about sanding wood and filling holes. Did you do any of that or just go for it with the paint? Hi Samantha! All I did was remove some of the old nails and a few shelves that were falling off, swept up, then used a leaf blower to get all the fine dirt out. I did wipe the floors down a bit before painting them, but I didn’t go crazy. 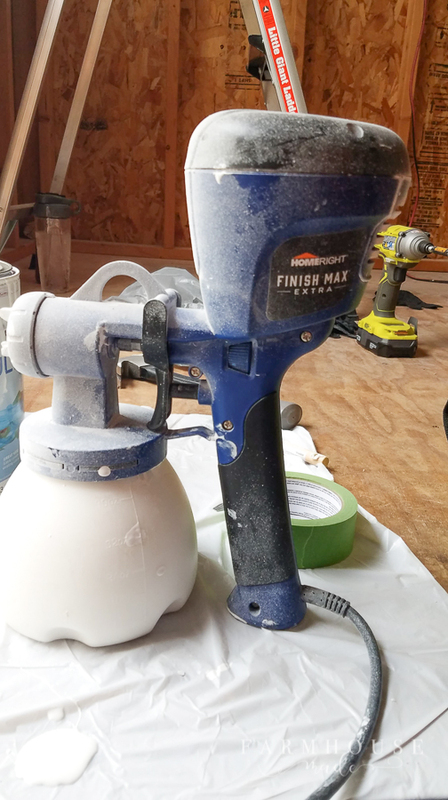 I definitely didn’t sand or prep much of anything – it was less prep than painting a room inside! Hi my husband just bought me a she shed for our 25 th Anniversary, brand new custom ordered, my question is, I love what you did here but I’m thinking of staining the wood studs the same color as the exterior wood color a red mahogany and then paint the ply wood panels. Im just not sure what color to go with now that I seen your white as I love how much light yours reflects. Any suggestions??? I did have them put plenty of windows in 8,and 2 large barn doors at each end for ventilation and airflow. It also has the front door with 4x 12 ft porch. It’s a 12 x 24 with a upper storage balcony like area. I hope my description isn’t confusing. Wasn’t sure if a gray or beige would work with red mahogany, but would love any suggestions you may have. I do plan on putting in a black rubber floor for cushioning in garden and craft section 12ft. I’ll paint the floor like you did the other 12 ft where any furniture may be and lay rugs. This is going to be a multi purpose shed crafts, gardening, storage up top, small social area for inside/outside fun. My husband is in the process of renovating a shed for me. I’d love to see pics of the outside of this one! He’s painting the inside of mine white, too, and I’ve asked for a gray floor. This looks awesome!